You may recall my DIY Home Security post from Flip #2. For $10, it was not a bad investment for the short time; however, for the long term, I don’t recommend it. Initially the stick-on alarms worked great, but over a short period of time (month or two) they all fell off. Once they had fallen off, the already cheap adhesive was gone for good; therefore, leaving me without home security. Another aspect of the Doberman Security I didn’t like was that it wasn’t really a peace of mind for me, but just a deterrent to an intruder. The buzzer would create a very loud alarm if the door was opened while the ON switch was in place. But that was the extent of what this “system” did. It didn’t alert authorities. I was still on my own for contacting 911 if an emergency happened. When I moved to Flip #3, I knew I still wanted a home security system. I knew people that were paying around $30-$60/month on home security, and that was not at all in my budget. After doing some research, I opted for Simplisafe. There were two primary draws to Simplisafe: price & peace of mind. As opposed to the last DIY home security I had, this one is connected to police & fire 24/7….even if I’m not home. Since the last system was mainly serving as “Scare people away,” Simplisafe not only serves that same purpose, but also contacts police immediately. Simplisafe is also a DIY home security system. At first, I thought it would be daunting to install everything, but it was as easy as they said it was. Installing the key pad is as simple as two sticky strips (that ACTUALLY stick!). There were a few little extras that really give me peace of mind. One of them was the panic button. They suggest to have it near the bed where you sleep, and if you wake up in the middle of the night to an intruder (or even if you think you heard something off), hit the panic button. Sometimes scrambling for a phone and dialing 911 in the middle of the night when you’re stressed and scared is really daunting. This makes it so simple: hit a button (and then you could call 911 to follow up). But once you hit that button, fire, EMT, and police are immediately dispatched to your property, and they are notified that a panic button set off the alarm. Another feature I enjoy is the SimpliSafe keychain. You can activate or deactivate your alarm even if you aren’t at your keypad. Furthermore, it has a panic button as well. For the refurbished system I chose, I was out of pocket around $200. I then pay $14/month for the monitoring system. The monitoring is not required, but I greatly appreciate it. The package I chose also came with a motion sensor. It detects up to 30′ of motion and can even distinguish between an animal and human. 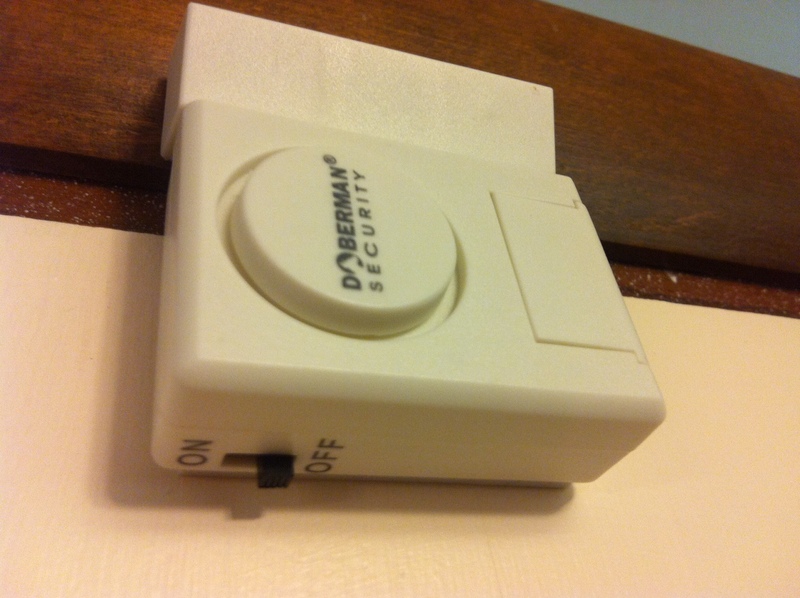 The motion sensor is active when you set the alarm. For $14/month, I genuinely feel safer. And I’m not sure you can put a price on that, but, in true me fashion, I do want the cheapest price on that! I’ve had the system for 9 months (only accidentally set off the alarm once! ), and I love it. I highly recommend it! This was not a sponsored or requested post. This is my genuine review of the product. I have finally gotten to this page of your Web site. Do you realize that you wrote about your SimpiSafe system on the same day I recommended it? God Bless You!